I recently "discovered" yet another great food blog, Good Things Catered. Katie, the author, has some fantastic recipes and beautiful photos and tips. In the past week, three of our dinners have been from her blog. 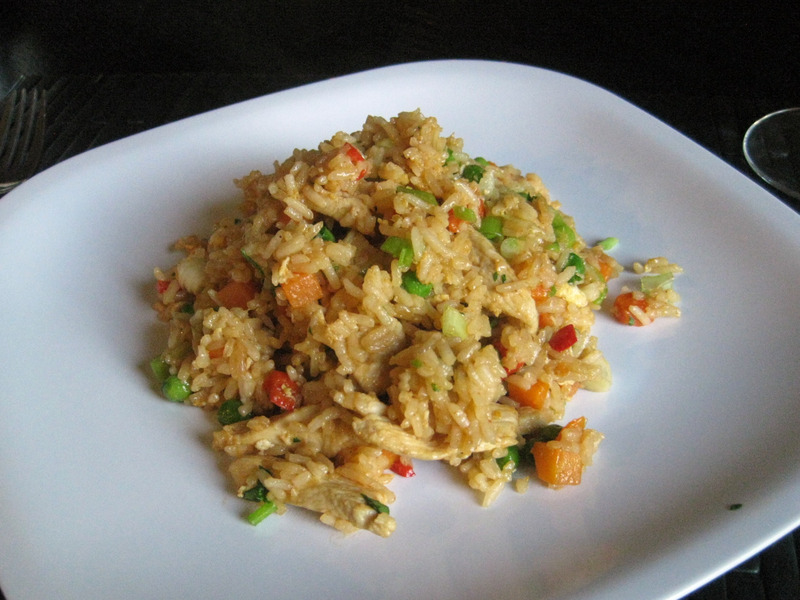 Last Friday I made Thai-Style Chicken Fried Rice. I picked quite a night to attempt a new recipe. I am off on Fridays all summer (due to an extended workday Monday-Thursday) and last Friday was my first day back on my "normal" schedule. I ended up getting caught in beach traffic on the way home from work and my one hour commute took over two hours. And it was hot. Very hot. There's no way I was in the mood to cook, so this is a typical evening when we'd call for takeout. E was running late, too, so I decided to start cooking. I talked to him on the phone for a half hour while I chopped and prepped all of the ingredients for the Thai-Style Chicken Fried Rice. I ended up being really happy that we didn't call for takeout. I've loved Thai food ever since I had my first Thai meal five years ago at Pru Thai in Clinton, NJ. When I first learned to cook I was mystified by Asian ingredients and cooking techniques and I never seemed to be able to get the flavors quite right. These days it is very common to find international foods in "regular" grocery stores. I used to have to drive all around town to find sesame oil, fresh ginger, sriacha sauce, and toasted sesame seeds, but now I can pick them up on my way home from work. I've been experimenting with stir fries for a few years now, so I had all of the ingredients for Thai-Style Fried Rice, so it became my Friday night experiment. The results were great! Now, I'm not saying I'm an authentic Thai cook, but the rice was really nice and held up well as a full meal. There were plenty of pieces of moist, sliced chicken and just enough spicy flavor to make you reach for your glass of water (but not enough to really burn you). The lime juice and green onions added a fresh flair to all of the spices. This recipe makes a lot (I'd say it can serve 4-5 as an entree), but we ended up eating it all over two days and fighting over the leftovers. I made some substitutions (in red), based on the ingredients I had on hand. -Prep all ingredients, vegetables, and in small bowl combine soy sauce, lime juice and chili sauce - set aside. -In large wok over medium high heat, heat oil until almost smoking. -Add garlic and ginger and cook, stirring constantly until beginning to brown. -Remove immediately with slotted spoon and set aside. -Add chicken, salt and pepper, and cook stirring constantly until almost cooked through, about 5 minutes. -Add peppers and carrots and continue to cook, stirring occasionally until veggies are crisp tender and chicken is cooked through, about 3 more minutes. -Remove chicken and veggies and set aside. -Crack two eggs into pan and cook, stirring constantly until beginning to firm up (not totally as you don't want it to overcook in the finish), about 20-30 seconds. -Add rice, ginger mixture, tomatoes, peas, soy sauce mixture, chicken, veggies and stir to combine thoroughly. -Remove from heat and fold in cilantro and green onion. Flour Tortillas and A VIDEO!